We met almost a year ago. The first time we met, we wouldn’t stop grinning at each other. We had the worst sushi waiter ever. He did the whole stretch-yawn-arm thing and I impatiently asked him if he was going to kiss me. He then did this voiceover thing that was something like “if I kiss her now, she’s expecting it, but if I don’t kiss her then she’s going to think I don’t want to and then what if she doesn’t go on a second date. It may be too late, maybe the moment has passed, or maybe the moment is just right oh now should I kiss her or wait? Because my voice over may make her expect it now . . . “ that had me laughing so hard I didn’t know if I could breathe. In so many ways things moved so fast and yet so slow all at the same time. At times we have asked each other, “Haven’t we always been together?” And yet, it hasn’t been a year. But it almost has. So last night, while at a comedy night featuring our favorite comedian and friend, I saw my boyfriend get up on stage and I waited to see what foolishness was about to happen. 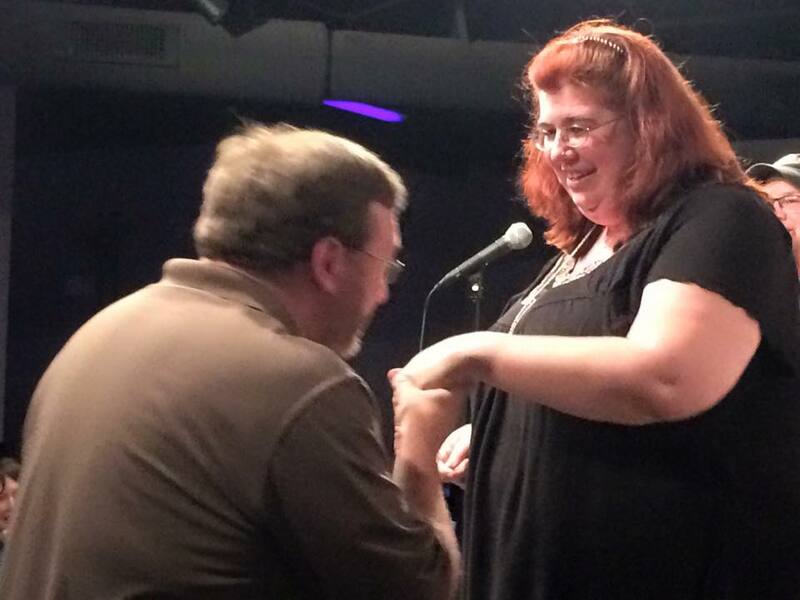 Then he took the mic, looked at me and asked me to marry him. Our friend cracked, “If you like it then you better put a ring on it,” which made everyone in the crowd go “ooooooh” until my boyfriend pulled out a ring box. It was all so surreal. I found myself heading up to the stage, grateful that I had decided to shave my legs and put on a skirt (yes, these are the things that run through my head) and hoping I didn’t trip on my way over there. And then suddenly –he asked me again and there was the ring and it was on my finger and I was trying to step off the stage without falling over. I took his wonderful face in my hands, feeling the stubble of his recently trimmed beard under my fingers, and I whispered, “Yes, yes, yes!” and kissed him. I laughed at all the jokes, I smiled at our friends at the table, I felt his hand in mind. My brain tried to process everything. We knew we were going to get married – we had talked about it – but I was not expecting to be asked that night. I had teased him that I can always guess these things – but I had no clue. The night ended in a flurry of phone calls and texts to friends and family before posting it on Facebook. Somehow, we safely got home. Somehow we got to work this morning. The day has been a chaotic euphoria of posts and texts and phone calls still. And work and lunch and getting gas. Normal life and surreality combined and intertwined itself like it always does. But mostly I just smile and count the minutes until I go home and ask him to tell me all again.